What do I need a DMP for? SAAS, SAP, ERP, GED, ROI… there are dozens of acronyms. However, there is one that could change your way of managing and make use of the data collected during your activity. This acronym is the DMP – the Data Management Platform. Are you wondering what these three words actually mean? Follow the guide! A secret recipe Imagine a druid gathering together all the ingredients needed to prepare a magic potion. This old spiritual character must mix up one by one all the ingredients massed on the shelves at his dispensary, measure the right and balanced amounts of them and stir them in a precise order so he can obtain the best concoction. In regard to data, the principle is the same. Do you need to reactivate certain clients with a specific profile? You must be able to target these clients by using CRM-centric data. The clients you are aiming are the ones who have bought on your site at least 10 times but haven’t bought anything for at least one year, who also have visited the site in the last month and who have put a product in the cart but never finished the sale in the last 3 months. Once the criteria have been defined, crossed, mixed and assembled, it will allow you to create a list including the clients whose profiles perfectly match the ones you want to contact again. You are no druid, but thanks to the DMP, you will be able to define all the variables of the profiles to reactivate in just a few clicks, the same way as if you assembled all the ingredients of a recipe, no matter how complex it is! From magic to technological reality… The ingredients in your potion are hundreds of thousands of data collected every day via all possible and imaginable channels. These ingredients are all over the place, disseminated in the shelves in the wizard’s laboratory. The druid, that is you, spoon in one hand, ready to mix up the ingredients but a bit lost to identify on your shelves the different ingredients that you will need to prepare your potion. The DMP is going to work as a druid’s assistant who will check kilometers of shelves to collect all the ingredients for the mixture without mistake, and will sort them according to the recipe book. Thanks to this sorting, the druid is able to keep only the molecules of each ingredient which are essential for the creation of this complex alchemy, obligatory for your own growth. Your DMP will also reconcile all your collected data to offer you a real in-depth vision of the interactions with the users and allow you to segment your customers’ data. To do this, the platform needs to have access to your CRM-centric data. This allows the platform to understand and to make an inventory of the whole of the ingredients it will be able to combine to produce the magic elixir… Identify the client’s journey in a cross-channel process It would have been unthinkable for a druid to imagine what a cross-channel process must represent for us today! Website, smartphone app, mobile site… the contact points between a user and your business are multiplying! The challenge is to be able to follow the user through no matter what channel they decided to use to interact with your brand. When the druid goes look for mistletoe, he knows where he’ll find it. It’s an easy target. However, today data come from all types of sources. The DMP brings closer the different ways to identify a client, in order to provide a synthesized vision of their interactions. The DMP can recognize a client by their ID (which they’ll use in an app or on a website), by their email address (if they are subscribed to a newsletter), or if they scan a QR-code from a magazine, for example. The DMP allows you to reconcile all the contact points between the client and the brand, unifying the buying cycle. Thanks to a more precise and universal knowledge of the client, it is possible to adapt the offers and propose a much more satisfying experience in order to improve the conversion. By making use of a DMP you will be able to have a coherence in your communication, as the platform allows you to send adapted messages answering the customers’ needs. You may retarget active clients – who have opened the newsletter but have not clicked on it – with an offer on the product appearing in the newsletter. The DMP allows you to identify the recipients and manage the two-phase reminders with innovative offers. By creating this segmentation, you will limit your investment to the target audiences offering the best conversion rates, as well as customize the website according to a customer’s profile, or even adapt your bids to keywords related to your strategy. Optimized programmatic targeting, databases updates, customization, and adaptation of marketing messages, media management… Beyond making easier the creation of that magic potion by gathering big amounts of data, the DMP will be able to identify who need the elixir the most, and how much of this elixir they need! This will significantly make the druid’s job easier and optimize the efficiency of his actions. 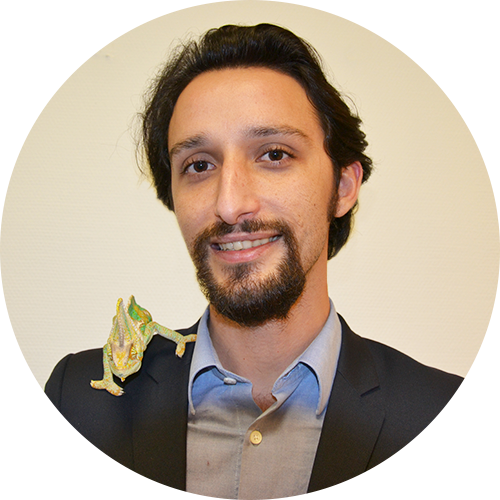 Know more about our interesting partnership with the optimization platform which provides solutions to marketers and has a chameleon as their pet! In this first interview, Claudio Muskus, Business Manager at Kameleoon, sheds some light on the company. Let’s start by introducing Kameleoon and your job in the company. Kameleoon is the conversion rate optimization platform for marketing teams. Our goal is to create a customized experience for web visitors thanks to the A/B testing and web personalization. Companies such as Fnac, Canal +, Meetic and many more – up to 400 – already use our solutions. I am the Business Development Manager at Kameleoon. My team and I oversee all the new clients, but we also make sure the needs of our long-time clients are covered. What are your client’s stakes in terms of digital strategy? Our clients’ goals are complex and varied. It all depends on their line of business and their business model. One client might have one or several goals, but to make it simple, at Kameleoon we distinguish three types of business objectives: – Improving their revenue and profit margin – eCommerce companies and retailers, such as Fnac, Darty, MAJE. – Optimizing their lead generation – banks and major brands, such as Renault. – Building up their web visitor’s loyalty – a very important issue for media such as 20 minutes or Le Figaro. What is the most frequent problem your clients face, and, in your opinion, why? Their most frequent issue is the lack of business agility. The marketing teams mostly feel that their needs in terms of continuous optimization are not really met. We must put ourselves in their shoes to understand that today the visitors’ needs evolve very fast. The smallest mistake on the user experience can lead to a failed conversion. On the other hand, it’s not easy to make a website evolve fast since each technical roadmap has its own restrictions. In these conditions, digital marketing teams usually feel frustrated. Kameleoon is the perfect solution to increase their agility and time to market. What makes you different from other solutions in the market? Our goal at Kameleoon is to help marketing and IT teams to create optimized web experiences for their visitors in an easy way. The solutions we provide are based on an architecture that makes use of the visitors’ data in real time. Kameleoon’s technology involves predictive algorithms capable of identifying the optimal segments for personalized campaigns. Thanks to Kameleoon, marketing teams can make use of their client knowledge and provide a proper response in real time according to the needs of their visitors. A few words to finish? Anything that comes to mind! David Bowie is gone, Leonardo DiCaprio has his first Academy Award, Portugal won the EuroCup against France, and the new iPhone came out. 2016 has been quite a year! We have also been busy at Eulerian. Do you still wonder how things work around here? For the curious ones, find here our 2016 in numbers. Our team (all departments gathered) put a great effort to meet our clients’ needs – and it pays back! Every year, their professional approach, their motivation, their cheerful disposition and their cohesion help our collaborators accomplish their most important task: ensure 100% satisfaction! We would like to share with your some numbers from 2016: 07 events. Networking is important. 85 kg of coffee. We are addicts! (for info, this is the maximum weight of a red kangaroo) 8,300 solved tickets. 13 new arrivals. We are getting big. 35 round trips between Paris and the cities of our branches. 02 marriages. They said YES! 02 joyful events. And more to come… 07 football matches. Organized by Eulerian for their teams and partners. 10 official after-work gatherings. Just between us, this is quite reasonable! 256 national and international press coverage. Gotta be proud! 24 new deals. 91 new contents. 4,000 content downloads. 09 certifications. 972 webinar attendees. The camera loves our collaborators. 1,041 tweets. 649 have been retweeted. We just need to keep the same pace for 2017! Putting on a great spread, choosing the essential ingredients and picking the right shaker. The 3rd edition of the Eulerian Summit took place on Wednesday, November 30th. A great success, and all thanks to you! To prepare this, Meliá Hotels International and Fnac are required to help. Sprinkle with clients testimonials and add: –	100gr of bravery facing the cold –	166l of motivated guests –	3mg of passionate speakers –	1 pack of smiles –	1 pinch of good mood Stir vigorously until you obtain a homogeneous, friendly mix. Leave to rest from 6.45 pm to 11 pm. Your Summit is a success! The Eulerian Technologies team would like to thank all the participants of this 3rd edition. See you all next year! Every year, Gartner releases the Magics Quadrants, which include all the major solutions of the market gathered according to their area of expertise. This year, Eulerian Technologies becomes part of the Magic Quadrant for Digital Marketing Analytics! In Eulerian Technologies, we are proud to be selected among the Vendors to Watch in the Magic Quadrant for Digital Marketing Analytics Gartner 2016 alongside IBM, AOL, Adobe, SAS, Google and many more technology providers. The selection is carried out according to a number of criteria judging the relevance, exhaustiveness, and efficiency of analytic solutions. More info to come soon! A DMP has become essential in the data-driven marketing field. Many questions have been raised about its utility and efficiency. Where is the potential? When is it obligatory and when just strongly recommended? The arrival of the Data Management Platform in the market means a revolution of the field and offers a wide range of marketing possibilities. The DMP is a unique tool that will reconcile 1st/2nd/3rd-party data and allow you to make use of them at the same time. Just like a breeding tank of data, the possibilities it offers adapt to every type of marketing scenario according to the business needs and performance obligations of each user. The DMP offers the possibility to deeply customize digital advertising, improve the targeting of campaigns, or analyze with precision the performance of the partners. To know more about this and discover practical examples, click here. As we announce on September 8th, Eulerian Technologies was among the finalists in the eAwards 2016 celebrated during the eShow Madrid, in the category "Best traffic generation and web analytics service". After many long hours of intense expectation, the verdict was out. They kept us waiting, but we finally got to know the result of the voting during the eAwards 2016 ceremony – Eulerian Technologies has won the “Best traffic generation and web analytics” award. The implementation of our solution shown in the case study PromoFarma.com convinced the voters, whom we would like to thank warmly. See you again next year! The eCommerce-Quebec exhibit will take place in Montréal, on October 12th and 13th. The convention center Palais des congrès of Montréal will welcome the actors of the field, announcers, and providers of technological solutions. For the first time since the opening of their Canadian branch in April 2016, Eulerian Technologies will attend the eCommerce-Quebec exhibit. The next October 12th and 13th, the Palais des Congrès of Montréal, chosen for the 3rd edition of the event, will welcome more than 1,000 participants, 50 exhibitors, and 300 retailers. For all of those interested on the eCommerce, the new technologies or the social media. Come meet our Canadian team at the booth no. 9. Enjoy 10% discount for your badge using the following code: ecomqc16. Discover all the details of the event by clicking here. This encounter is the first of a series of e-commerce platform meet-ups, organized by Altima in partnership with Ecritel and Eulerian Technologies. The event will take place at the Hôtel Gault, Montreal next Thursday, September 29th, from 5:30PM on. Three experienced actors gathered to discuss one common topic - how to optimize the e-commerce performance. Discover their experience through the presentation of some case studies. This first partnership rendezvous will be the perfect occasion not only to address several topics related to the performances of your e-commerce site but also to meet up and have a chat in a nice environment. Next Thursday, September 29th, Gael Cottet, Country Manager of Eulerian Technologies – Canada, Felix Averlant, Digital Performance Strategist at Altima North America, and Geoffrey Vander Weerdt, Managing Director in North America at Ecritel, will take the floor and answer the following questions: –	Why should I invest in a data platform focused on B2B and B2C marketing? –	How do I optimize the conversion rate using a data-driven strategy? –	How do I maximize the display time on my website? People from Montreal or passing through – are you still asking yourselves these questions? If you are still free in the evening of September 29th, save the date in your agenda and come join us! If you want to join this event, please click here. Hôtel Gault, 449, rue Sainte-Hélène, Montréal (QC.) Canada H2Y 2K9, from 5:30PM on. Eulerian Technologies will attend the E-COMMERCE PARIS 2016 exhibit for the 5th year in a row. During the Paris Retail Week, the 2016 edition of the E-COMMERCE PARIS exhibit will take place in pavilion 2, Porte de Versailles, between September 12th and 14th. It has been conceived as a “business and togetherness” event. It will welcome the main European actors of the cross-channel strategy (Technologies, Customer Experience, Digital Marketing, and Logistics), more than 50,000 visitors and 1,000 participant companies. On this occasion, Akim Bellour, our senior Vice-President and Global Sales, and Mohamed Sag (Fnac) will take part of the “Programmatic media activation of DMP targets” workshop, organized by Tradelab. The talk will take place on Monday, September 12th, between 10.45 and 11.30AM (room 5, pavilion 2.1). The discussion will be on how to build target audiences, how to adapt media investments in real team, and how to evaluate the results of the latter. Find our team on the 2nd floor in stand D 019 from September 12th until 14th. To know more about the Paris Retail Week and the E-COMMERCE PARIS 2016 exhibit, click here. In partnership with Tradelab, Eulerian Technologies presents how their client Photobox has been able to activate their data to get a better media customization, thanks to the DMP and the programmatic buying platform. With the support of the two French tech actors – Eulerian Technologies and Tradelab –, Photobox, the European leader in personalized photo products, decided to put their data in a privileged place in their digital marketing strategy. You might be wondering how a DMP can help anybody’s marketing strategy. One of the answers to this question is right in front of your eyes! Through this case study, you will discover how the use of 2nd-party data enables you to reinforce your advertising messages addressed to your clients and/or prospects. Xavier Suraud, Head of Display at Photobox, points out: “As a part of Photobox’s identity and intrinsically linked to our products, the customization is an essential point in our display strategy. The promotion of strongly emotional products must be perfectly targeted – the technical architecture of the DMP and the buying platform play a key role to achieve this goal.” Photobox goes even further. To know more you may download the case. There is an inescapable fact – Adblocking solutions are everywhere. As a user, having a filter sorting the ads to avoid the most intrusive ones equals a more fluid browsing. However, it makes it very difficult for advertisers making use of these data on a daily basis to do their jobs. To discover the entire article, click here. Since 2009, DMEXCO is one of the most important exhibitions in the international digital marketing scenario. Welcoming 50,000 visitors and more than 900 exhibitors this year, DMEXCO offers all participants a platform to present their innovations and discover the new technological and online marketing trends. In partnership with Ratecard, Eulerian Technologies will share this 400 square meters space alongside many more market players. Come visit us in Hall 7, E061 – F068! To know more about DMEXCO 2016, click here. The Parc des Expositions (in Porte de Versailles, Paris) will welcome from June 30th until July 2nd the first edition of Viva Technology, an event dedicated to innovation. More than 30,000 people and 5,000 startups from all over the world are expected. A rich program of 300 talks with well-known speakers such as Eric Schmidt (CEO at Google) or David Kenny (CEO at IBM Watson, an AI project). Eulerian Technologies takes part of this event in the Lab Open Transportation of the SNCF, a space combining the many innovative actors contributing to imagining and developing the transport of people and freight. Come meet us in stand SNC_040. To know more about the Viva Technology event, click here. 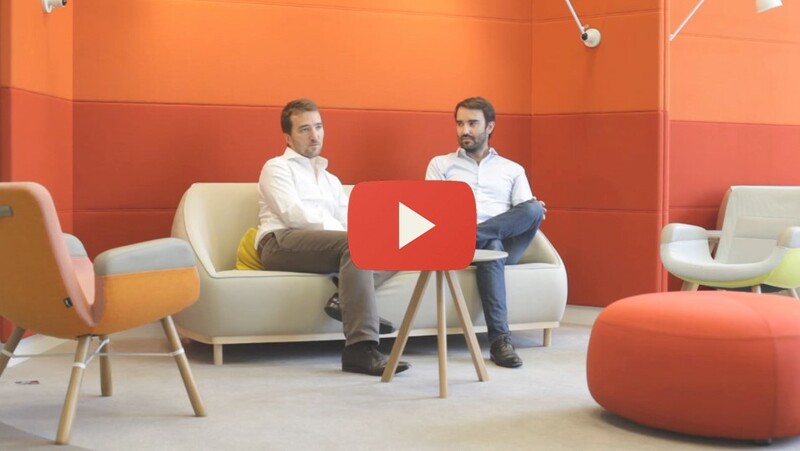 Thanks to their innovative technology, Eulerian Technologies is the French leader in real-time analysis and optimization of e-marketing operations. The company counts today 40 experts allocated in France, Spain, and Canada, and works with the biggest firms in the European market. In 2016, after signing with two big Canadian brands from Quebec, Artemano and Loto Quebec, Eulerian Technologies sent their VP Sales, Akim Bellour, to help developping and supporting the growth of their Canadian branch, with the American market in focus for 2017. Key figures of 2015 •	€5.7 million revenue, that being a 30% year-over-year growth for the last five years •	10% revenue reinvested in R&D every year •	40 billion data processed per month •	40% French top e-commerce, 16% European top e-commerce •	10 new assets in 2015, 14 planned for 2016 •	Opening and development of a Canadian agency. •	Development of the Spanish agency, 10 new clients among which we find Meliá Hotels International (3rd hotel chain in Europe) and more recently the Oney Banque Accord group. •	Eulerian Technologies provide their service to 140 clients, analyzing more than 700 websites – PMU, Voyage Privé, Brandalley, Voyages-SNCF.com, Celio, SFR, 3 Suisses, Fnac, Sarenza, Galeries Lafayette, Menlook, Photobox, Audi, Canal +, Warner Bros., Leclerc… Objectives and strategy for 2016 In 2016, Eulerian Technologies looks into keeping the same direction to expand internationally, carrying on the same growth rate (+30% year-over-year), as well as establishing in Spain and Canada. The latter will particularly become a business referent before approaching the US and the American market in 2017. In order to achieve these goals and to approach this international deployment in the best possible way, Eulerian Technologies count on the consulting firm Gartner for a customized support, especially to adapt their offer and positioning in the highly competitive Northern-American markets. Emmanuel Brunet, CEO of Eulerian Technologies: “We are very happy that Eulerian Technologies became a referent company in France and maintains this position, thanks to our innovative data marketing solutions. And we are pleased our international development is taking the same path.” Eulerian Technologies – a real competition against the well-known American solutions Unique and efficient, the Customer Data Platform developed by Eulerian Technologies allows clients to optimize their marketing operations. Thus they can build up their own data collection, take smart decisions and master their marketing communication. Available in SaaS mode, Eulerian Technologies solution is based on a data gathering platform. This platform meets the clients’ main e-marketing needs in real time – web-analytics, cross-device attribution, DMP, data activation, tag management and much more. With more than 250 partners in the world, Eulerian Technologies solutions allow their clients to create their own partner ecosystem. In fact, Eulerian Technologies help the deployment and integration of their solutions in favor of their common clients. As a result, clients save time and a significant amount of resources. The people-oriented company competes and proposes a real alternative to American technologies! Owing their propietary technical architecture, the company’s reactivity stands up to any test. Almost all of their functionalities work in real time, a performance not easy to equal in the market. The account management team in Eulerian Technologies integrates regular updates to meet their clients’ particular needs. The French leader can also manage the incorporation of their solutions within particularly short times, a flexibility especially appreciated on the market. As a trusted third party, Eulerian Technologies do not buy nor sell advertising spaces. The company does not advise their clients on marketing investment decisions. The goal is to remain completely neutral as well as to offer a global impartial review of online and offline marketing campaigns. Because of their neutrality, they have been able to build solid relationships within the ad-tech and the e-commerce markets, in order to place themselves in the center of the partner ecosystem of their clients. Among the great number of partners Eulerian Technologies rely on, more than 250 today, we find Google DoubleClick, Facebook Atlas, Criteo, Marin Software, RadiumOne or AdGear. Emmanuel Brunet, CEO Emmanuel Brunet is one of the 20 most active French business angels (source: Challenges magazine, 2015). He has been particularly present on the digital market, more precisely on the analytics, for almost 20 years. A true expert on all the subjects related to the digital world. He is an associate and board member of the startup accelerator 50 Partners. He is also part of the board of directors of several companies, such as Ventealapropriete.com, Wheretoget.it or AdForum. Integrate your data with BigQuery. Duplicate your data flow in real time to feed your BI systems and unblock all performance indicators and estimated analyses. Share your user segments to adapt your Double Click Manager and Google Adwords RLSA campaigns. Guide your retargeting strategy in real time or by sending a cold database. Synchronize the structure of your accounts and share your budget for DoubleClick for Advertisers and DobleClick Bid Manager campaigns. Your budget analyses get simplified in your Eulerian Data Decision Platform (DDP). Synchronize your DoubleClick Search conversions in order to optimize your performance. Share a deduplication file according to your view in your Eulerian DDP and use the data to optimize your bidding in Google Adwords. The tag Eulerian will be integrated as a native tag in the Google Tag Manager. Eulerian Technologies will participate in the E-Commerce Paris 2015 trade show held in Paris, at the Parc des Expositions near Porte de Versailles, on September 23rd-25th. E-Commerce Paris is the biggest event in the French e-commerce calendar. The event dedicated to cross-channel marketing, combines a trade show and conferences with a place to exchange and share ideas. The 2015 edition will gather around 30 000 visitors and 500 exhibitors. The trade show is divided into 4 exhibition areas from the online commerce world: technology, digital marketing, customer experience, logistics and will feature 2 dedicated villages : Start-Ups and Social Shopping & Mobile Experience. We would like to remind you that Eulerian Technologies is one of the finalists of the E-Commerce Awards 2015 in the “Customer Experience” category thanks to new features in its Eulerian Analytics solution allowing to reconcile all offline and online marketing data of an advertiser. Winners will be announced September 21 at the trade show. Come visit us at Booth Q50 during those 3 days to meet our teams and to find out more about our solutions and new features. For more information about E-Commerce Paris 2015 trade show, click here. Eulerian Technologies will participate in the dmexco trade show, the international event dedicated to digital marketing that will take place on September 16 and 17, 2015, in Cologne, in Germany. With more than 800 exhibitors, 30 000 visitors and 500 speakers, this trade show has become one of the key events of the digital world thanks to its international dimension. You are welcome to come and meet us during those 2 days on stand E059/F058 in the Hall 7. Register now. Tickets are free until August 17, but after that date an entrance fee will apply. For tickets, click here. For more information about the dmexco 2015 trade show. Eulerian Technologies is a finalist for the 2015 E-Commerce Awards, rewarding the most innovative solutions of the industry. This year, 22 finalists have been chosen amongst the 250 applications submitted. Eulerian Technologies is one of the 3 finalists in the “Customer Experience” category with a new feature of its Eulerian Analytics solution. This feature allows to reconcile all offline and online marketing data (CRM, ad and site-centrics, sales in stores) of an advertiser. The winner will be chosen by a jury of leaders from the e-commerce industry. The award ceremony will take place on September 21th 2015, at the E-commerce Paris tradeshow, at Porte de Versailles. The Eulerian Technologies teams will be there to welcome you throughout the tradeshow from September 23rd to 25th 2015, on stand Q 050. Come and meet us to talk about your needs and your projects or to know more about the E-Commerce Awards finalist solution, Eulerian Analytics. Eulerian Technologies has recently expanded its partners list and has for overall goal to offer an ever-expanding range of interconnections with its clients’ technical partners: third party tag management, effortless data import and export formatting but also real-time information sharing.